Moz's 2018 Local Search Ranking Factors - A Must Read for Innkeepers! Many thanks to Darren Shaw for his work in publishing the 2018 Local Search Ranking Factors. BTW: Absolutely LOVED the new survey format you provided the participants to use this year! Acorn Internet Services, Inc. is proud to be included, once again, to share input from the Bed and Breakfast industry. At the end of the report I’ve included all the participants who contributed to this year’s survey. You will find experts in the US, Canada and United Kingdom with areas of expertise ranging from Medical to Automotive, Small to Large Businesses, and Individual Clients to Agencies and everything in between! For Innkeepers to succeed in today’s Local Search environment, you must understand that the direction that Local Search has taken, and continues to take, requires individualized strategies involving OTAs / Google Hotel Finder that other types of businesses such as Law Firms, Medical, Automotive, Plumbers, etc. do not have to struggle with. As you’ve heard us say over and over again, Google wants to control how your data is seen. This theme is clearly evident in Moz’s 2018 Local Search Ranking Factors. Take Away: Noticed your bookings dropping? Paying too much in OTA fees? This is one, if not the primary reason as to why. A quality Web design is still needed. Blogging, Newsletters and Social Media are still valid for continuing customer engagement. But if you seriously want to improve your business, an individualized strategy to manage your GMB listing, including your OTA strategy via Revenue Management should be at the top of your marketing list of todo’s. Also, many of the survey participants shared the increasing benefit of using features in GMB (Google My Business) to help promote their clients. 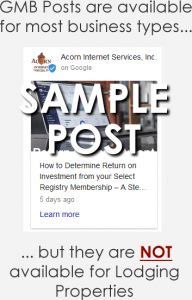 These experts are seeing added value with the use of GMB Posts to promote their clients. This is yet another difference between Lodging vs. Non-Lodging Listings. Hotels, Bed and Breakfasts and most all types of Lodging Properties are denied access (except for Cabins) to GMB Posts. They are also denied the ability to update their description, include a direct link to their booking engine, and add menu links. 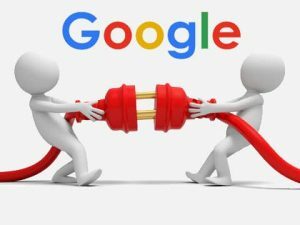 Tim Capper, who is also a contributor to this survey, has very neatly quantified in his blog post “How Google Exploits the Hospitality Industry for Profit” showing how lodging properties in the UK are losing out by not having access to these features. US Lodging Properties are experiencing these very same issues. Posts Posted comes in at #2, only second beyond Quality/Authority of Inbound Links to Domain. See what 16 experts in this survey are saying about GMB Posts. Pay attention to some of these quotes, as they also include other items that lodging properties are denied access to in their GMB accounts, being a benefit to their Non-Lodging clients. Lisa Kolb, Acorn Internet Services, Inc. So – Why are we Deep Diving on this topic of GMB Posts? Because it seriously puts our Industry at a disadvantage (one of many). Especially when so many of the other experts in this survey are using these tools to their Non-Lodging clients’ advantage when Google denies our Lodging clients access to the same tools. Take Away: If you care about these services that you are being denied, and want to see change, please make sure to get involved as we pursue these and other issues that affect our industry with the support and assistance of both AIHP and PAII. To get involved you may contact any of us at the link below. Joy Hawkins, Colan Nielsen – Sterling Sky Inc.